No matter what time of year it is, I get excited when I see pinwheel recipes at a potluck or party. They’re just so fun and easy to eat. Not to mention the flavor possibilities are endless. Since Mexican food is one of my favorite things to eat, I knew I had to make roll-ups stuffed with those flavors. 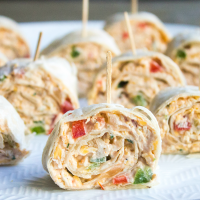 These pinwheels are reminiscent of the Southwest Egg Rolls you can order at most restaurants without all the work. This easy Mexican Pinwheels Recipe is a party favorite that's full of bright, bold flavors you'll crave! Your guests will ask for seconds and thirds! To a large mixing bowl, add the cream cheese, oregano, garlic powder, and cumin. Use a spoon or spatula to mix everything together until evenly combined. Add the cheese, chicken, and salsa to the cream cheese mixture. Stir together until evenly combined. Add the cilantro and bell peppers to the filling. Stir until incorporated. Lay one tortilla flat on a cutting board. Place 1/3 of the filling in the center of the tortilla. Use the back of a spoon or a spatula to spread the filling evenly over the tortilla. (You don't need to go all the way to the sides as they will be discarded later.) Carefully roll up the tortilla, starting with the side closest to you, until you create a log shape. Repeat filling and rolling the remaining two tortillas, using 1/3 of the filling for each. Place the pinwheels on a serving plate. The number of pinwheels will vary based on the size of your tortillas, the amount of filling used, and how thick you cut the slices. You can cut down on the prep time by using store-bought rotisserie chicken or using left oven chicken from dinner the night before. 0 Response to "MEXICAN PINWHEELS"